Pope Francis has been excoriating capitalism lately, blaming it for causing global injustice and climate change, and even comparing the excesses of unfettered capitalism to the “dung of the devil.” The pontiff’s strong anti-capitalism message reminded me of the chart above. 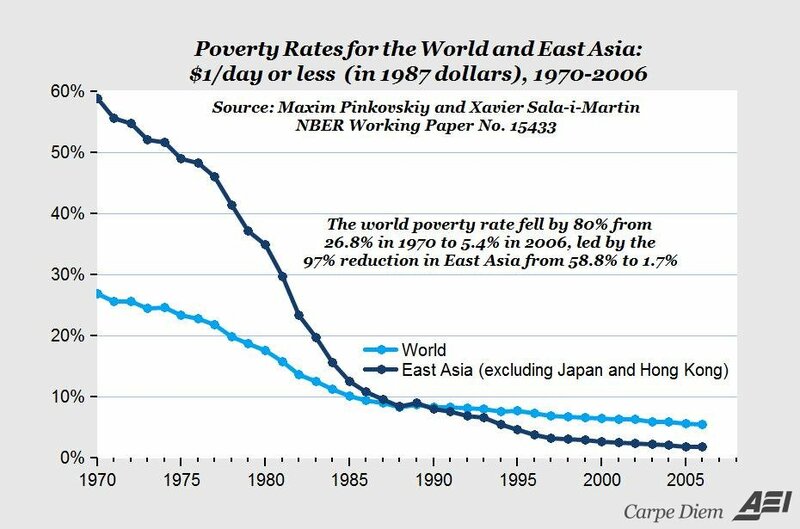 In a CD post in 2013, I suggested that a slightly different version of the chart could perhaps qualify as the “chart of the century” because it illustrates one of the most remarkable achievements in human history: the 80% reduction in world poverty in only 36 years, from 26.8% of the world’s population living on $1 or less (in 1987 dollars) in 1970 to only 5.4% in 2006 (light blue line), led by the 97% reduction in the poverty rate in East Asia (excluding Japan and Hong Kong) from 58.8% to 1.7% over that time period. The data in the chart come from a 2009 NBER working paper “Parametric Estimations of the World Distribution of Income,” by economists Maxim Pinkovskiy (MIT) and Xavier Sala-i-Martin (Columbia). MP: I would argue that free market capitalism, American style, has done more to reduce world poverty than any anti-poverty efforts of the Catholic Church and the Vatican. In fact, I would even argue that just one free-market capitalist corporation – Walmart – might even do as much, or more, to alleviate poverty by providing everyday low prices and jobs for hundreds of thousands of low-income people than the anti-poverty efforts of the Catholic Church in the countries where Walmart operates (US, Mexico, Guatemala, Nicaragua, Brazil, Argentina, Chile, India, China, and nine African countries). In addition to reducing poverty with low-cost groceries, clothing and household goods, Walmart improves the lives of underserved individuals and communities with $1.4 billion in charitable giving every year, which is almost $4 million every day!